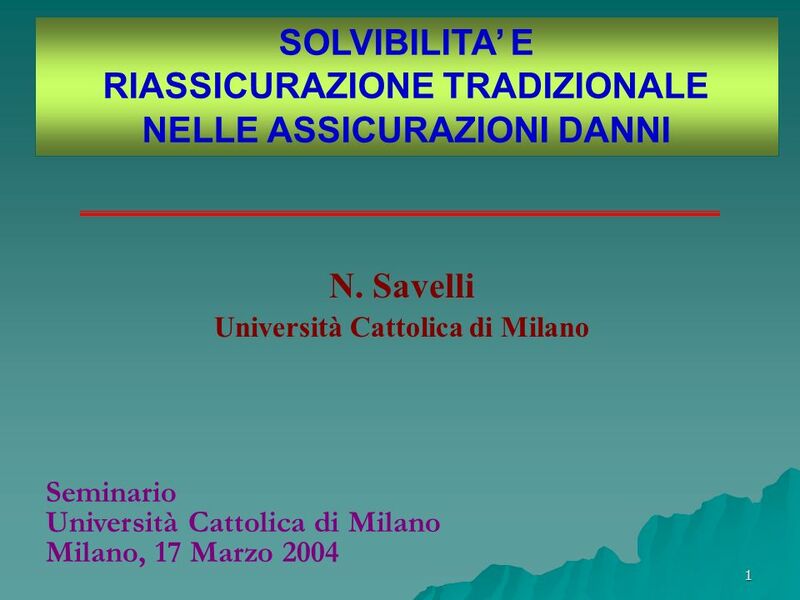 1 SOLVIBILITA E RIASSICURAZIONE TRADIZIONALE NELLE ASSICURAZIONI DANNI N. Savelli Università Cattolica di Milano Seminario Università Cattolica di Milano. 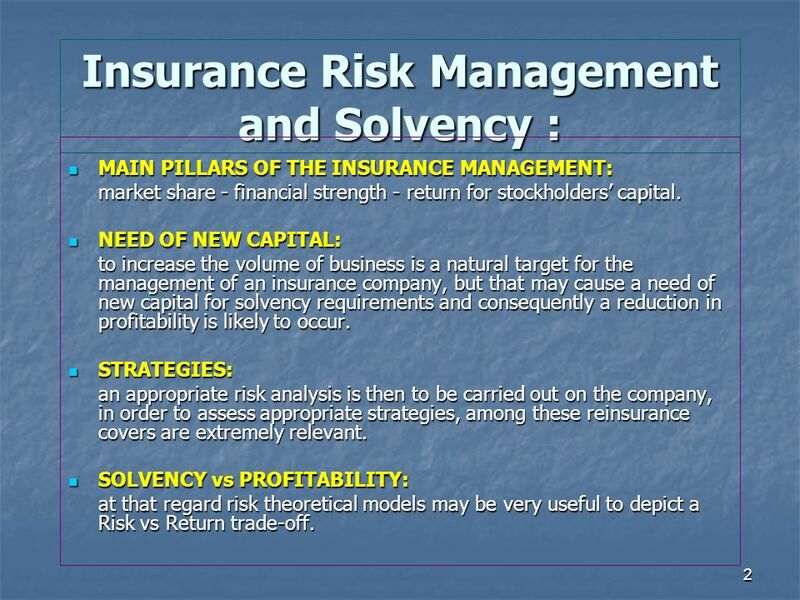 2 2 Insurance Risk Management and Solvency : MAIN PILLARS OF THE INSURANCE MANAGEMENT: MAIN PILLARS OF THE INSURANCE MANAGEMENT: market share - financial strength - return for stockholders capital. 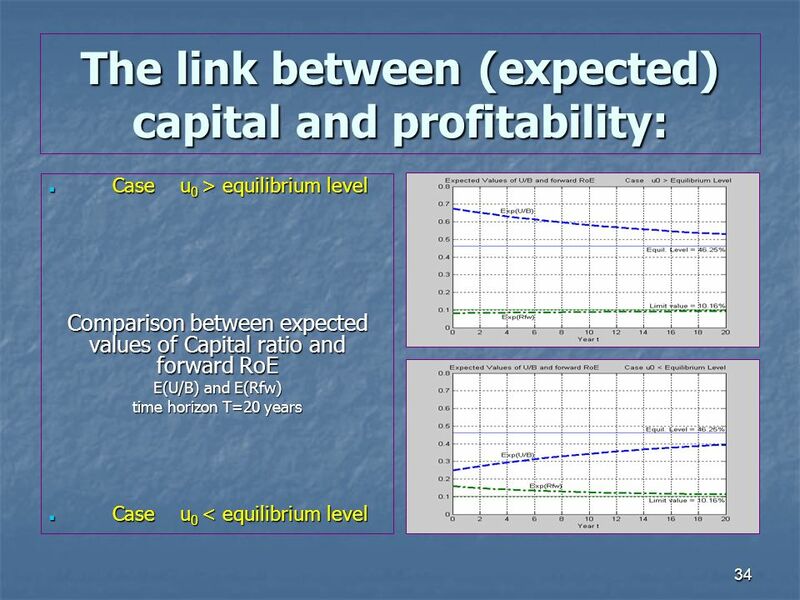 NEED OF NEW CAPITAL: NEED OF NEW CAPITAL: to increase the volume of business is a natural target for the management of an insurance company, but that may cause a need of new capital for solvency requirements and consequently a reduction in profitability is likely to occur. 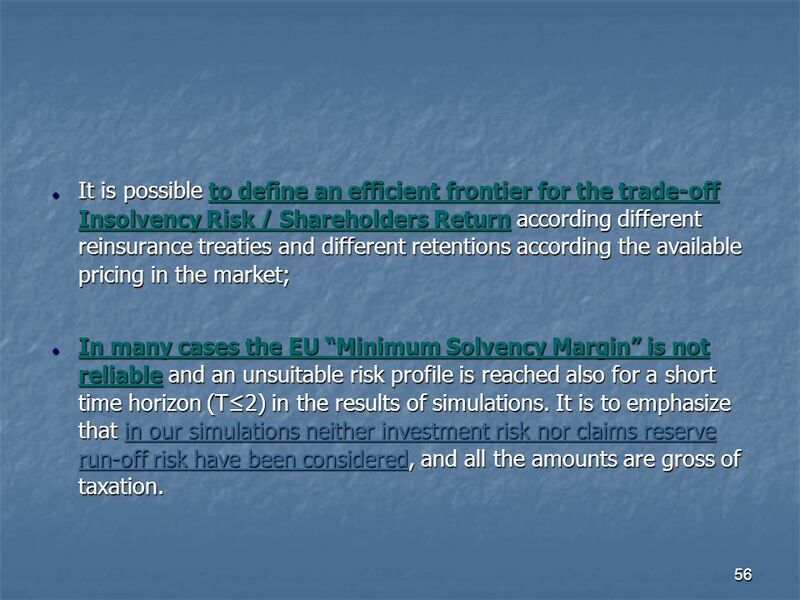 STRATEGIES: STRATEGIES: an appropriate risk analysis is then to be carried out on the company, in order to assess appropriate strategies, among these reinsurance covers are extremely relevant. 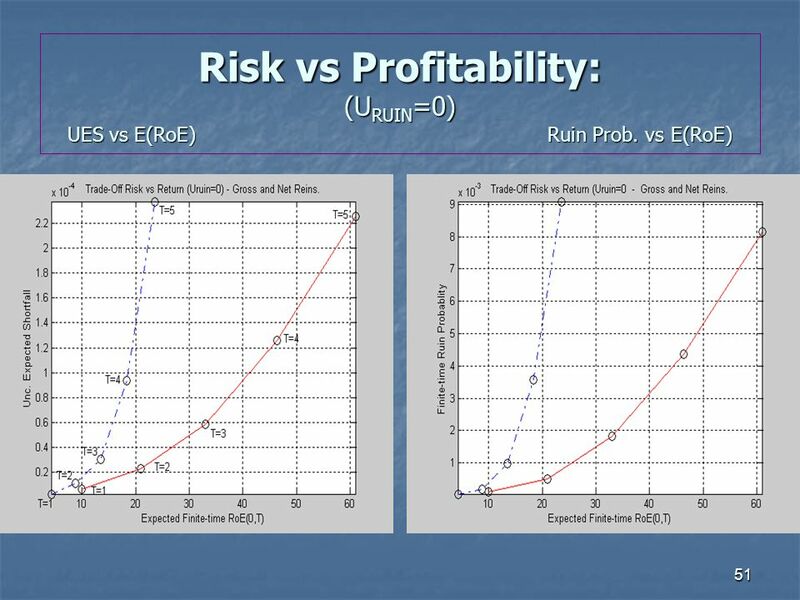 SOLVENCY vs PROFITABILITY: SOLVENCY vs PROFITABILITY: at that regard risk theoretical models may be very useful to depict a Risk vs Return trade-off. 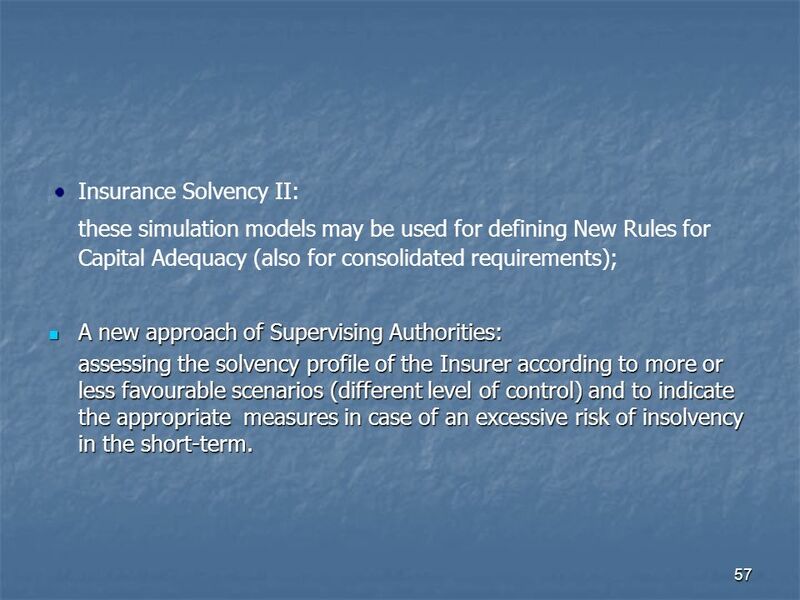 3 3 SOLVENCY II: simulation models may be used for defining New Rules for Capital Adequacy; A NEW APPROACH OF SUPERVISORY AUTHORITIES: A NEW APPROACH OF SUPERVISORY AUTHORITIES: assessing the solvency profile of the Insurer according to more or less favourable scenarios (different level of control) and to indicate the appropriate measures in case of an excessive risk of insolvency in the short-term; INTERNAL RISK MODELS: INTERNAL RISK MODELS: to be used not only for solvency purposes but also for managements strategies. 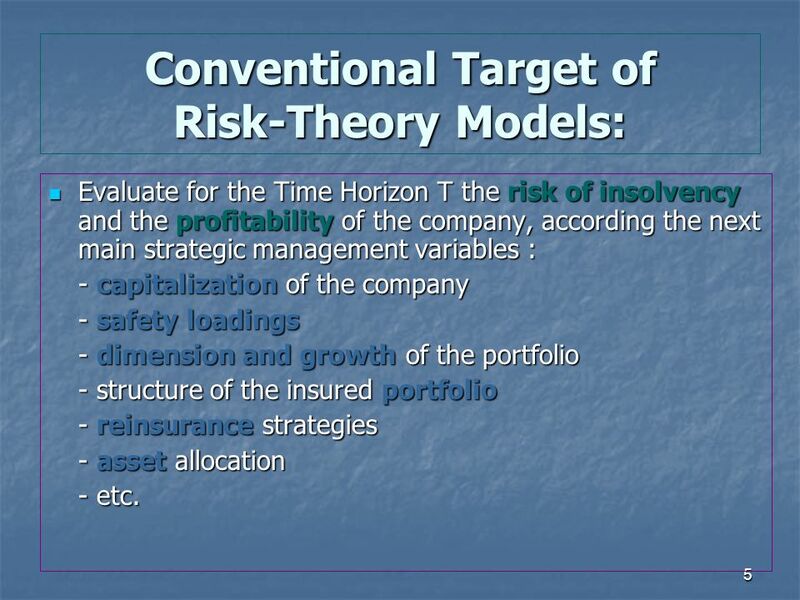 5 5 Conventional Target of Risk-Theory Models: Evaluate for the Time Horizon T the risk of insolvency and the profitability of the company, according the next main strategic management variables : Evaluate for the Time Horizon T the risk of insolvency and the profitability of the company, according the next main strategic management variables : - capitalization of the company - safety loadings - dimension and growth of the portfolio - structure of the insured portfolio - reinsurance strategies - asset allocation - etc. 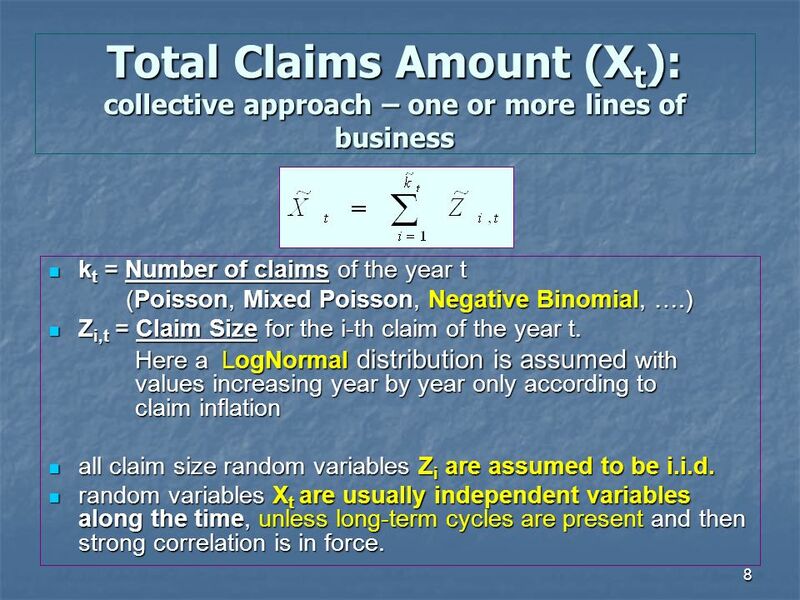 8 8 Total Claims Amount (X t ): collective approach – one or more lines of business k t = Number of claims of the year t k t = Number of claims of the year t (Poisson, Mixed Poisson, Negative Binomial, ….) 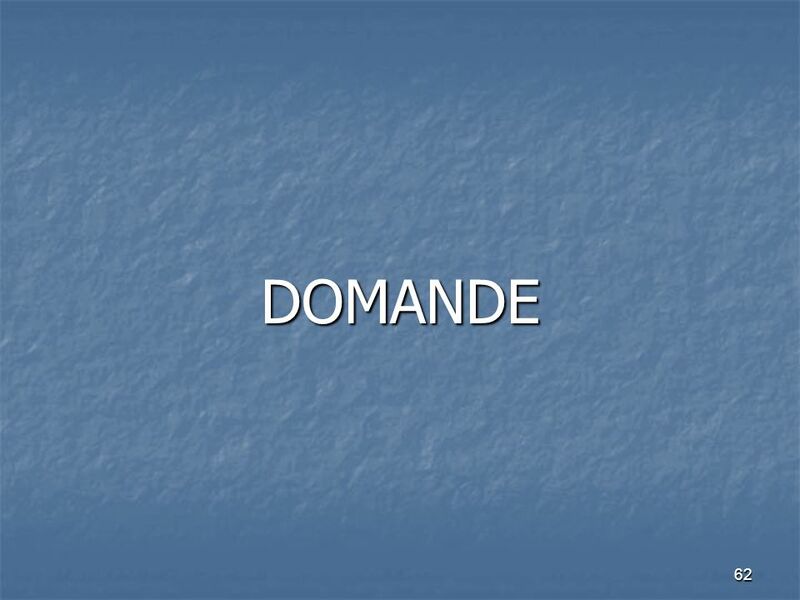 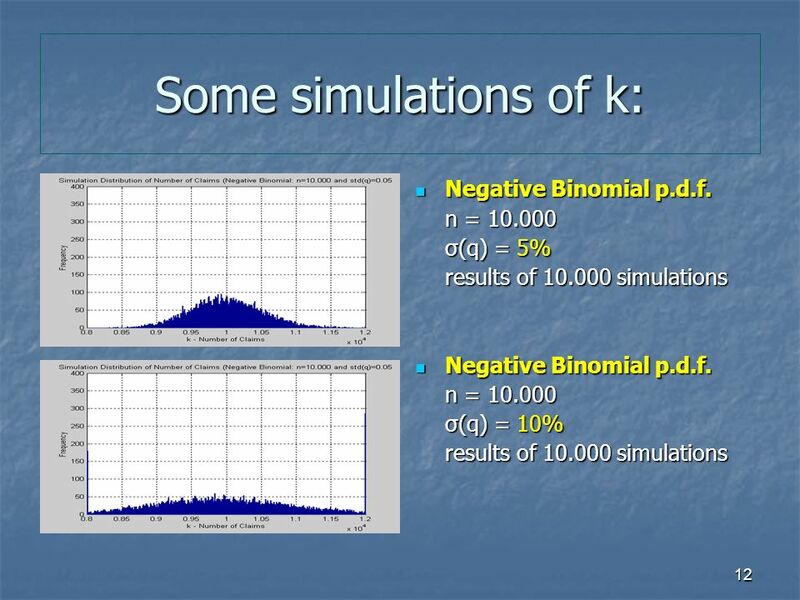 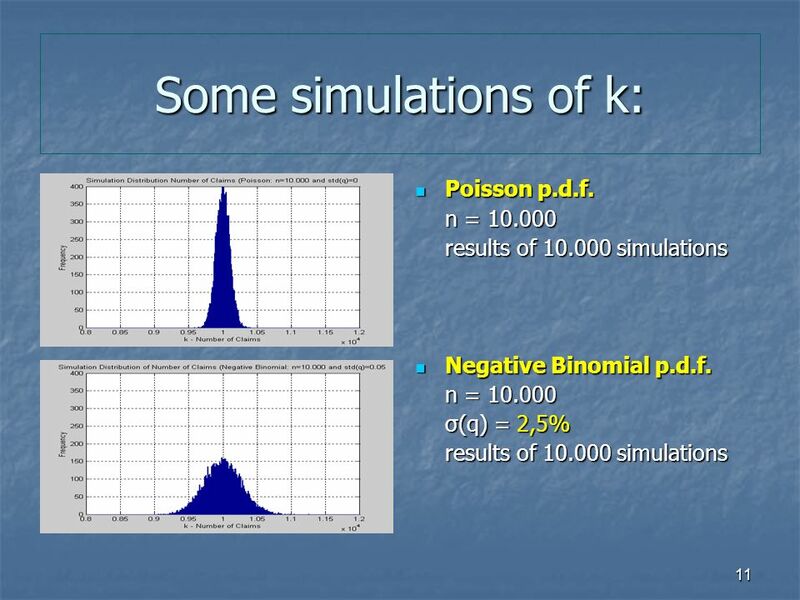 (Poisson, Mixed Poisson, Negative Binomial, ….) 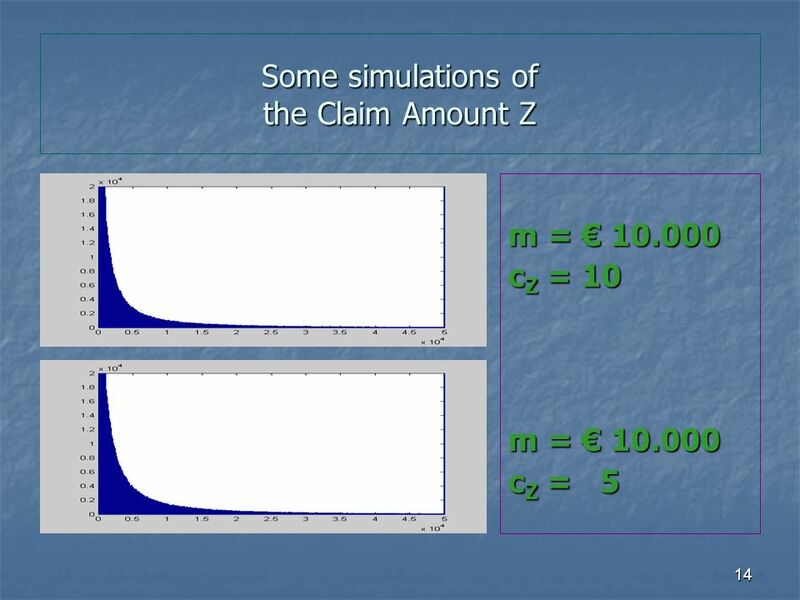 Z i,t = Claim Size for the i-th claim of the year t. Z i,t = Claim Size for the i-th claim of the year t. Here a LogNormal distribution is assumed with values increasing year by year only according to claim inflation all claim size random variables Z i are assumed to be i.i.d. 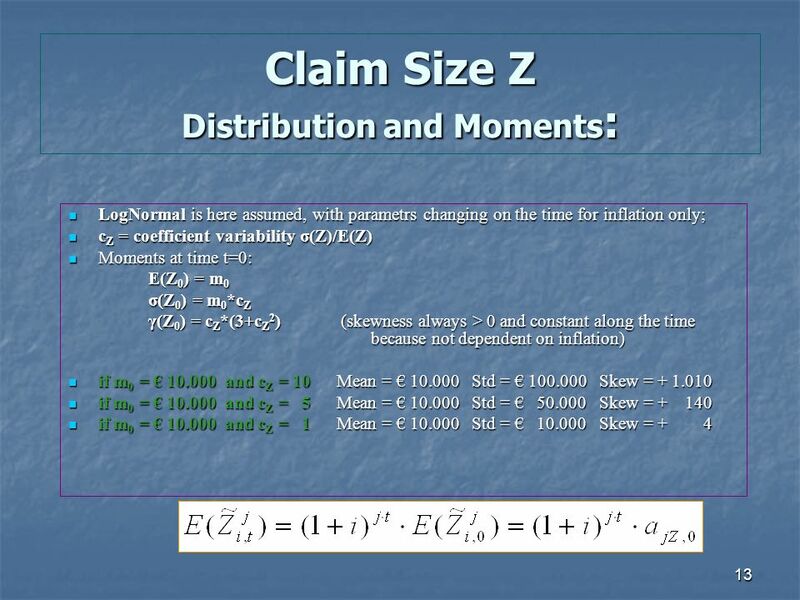 all claim size random variables Z i are assumed to be i.i.d. 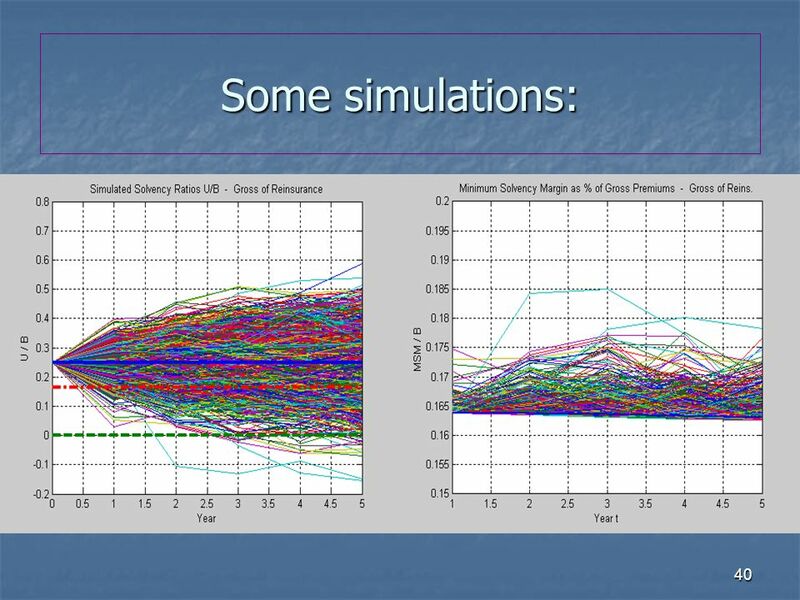 random variables X t are usually independent variables along the time, unless long-term cycles are present and then strong correlation is in force. 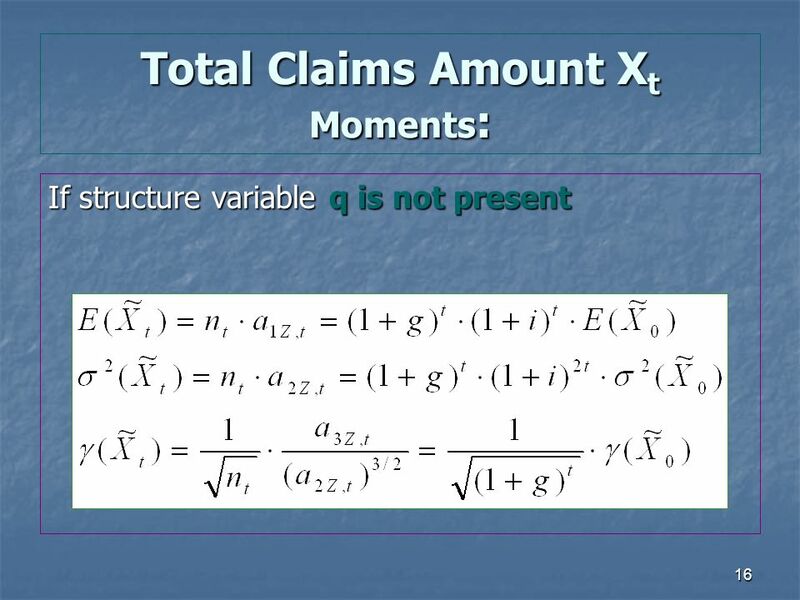 random variables X t are usually independent variables along the time, unless long-term cycles are present and then strong correlation is in force. 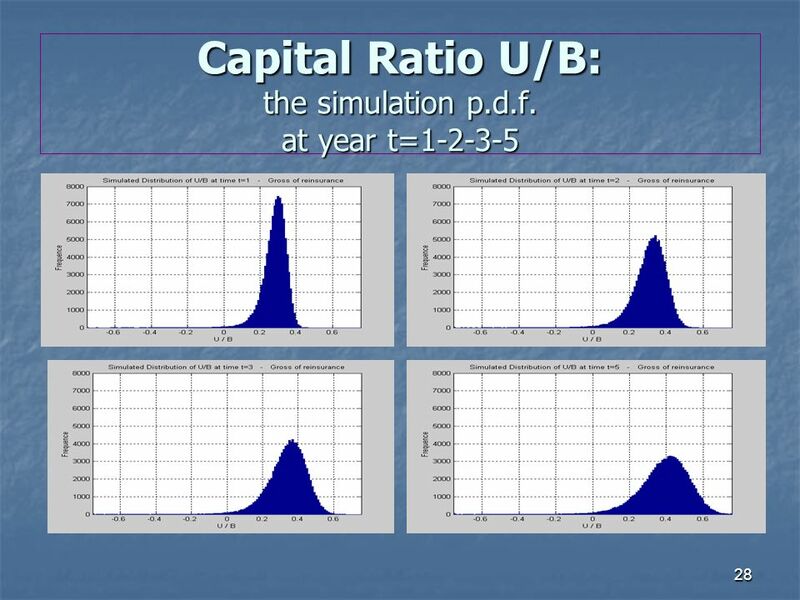 26 26 Some comments : Expected Value of the ratio U/B is increasing from the initial value 25% to 40% at year t=5. 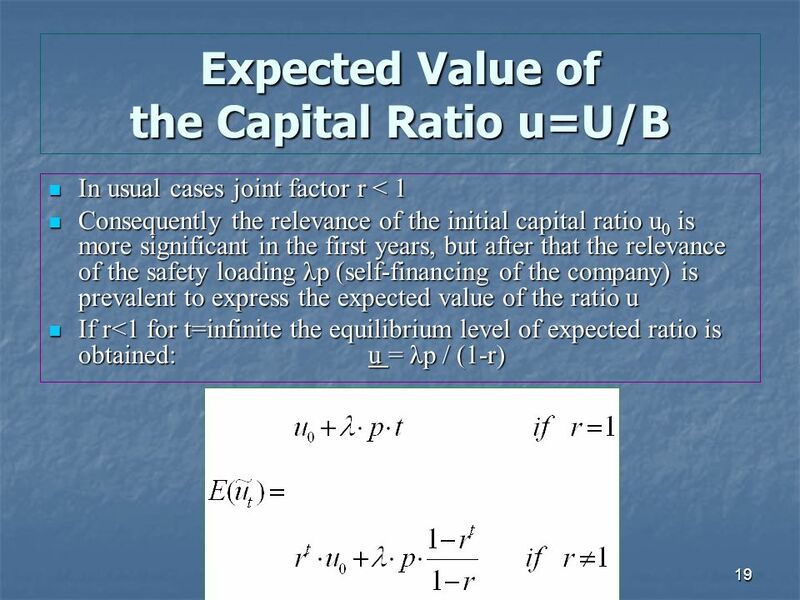 It is useful to note that for the Medium Insurer the expected value of the Profit Ratio Y/B is increasing approximately from 4,50% of year 1 to 5% of year 5; Expected Value of the ratio U/B is increasing from the initial value 25% to 40% at year t=5. 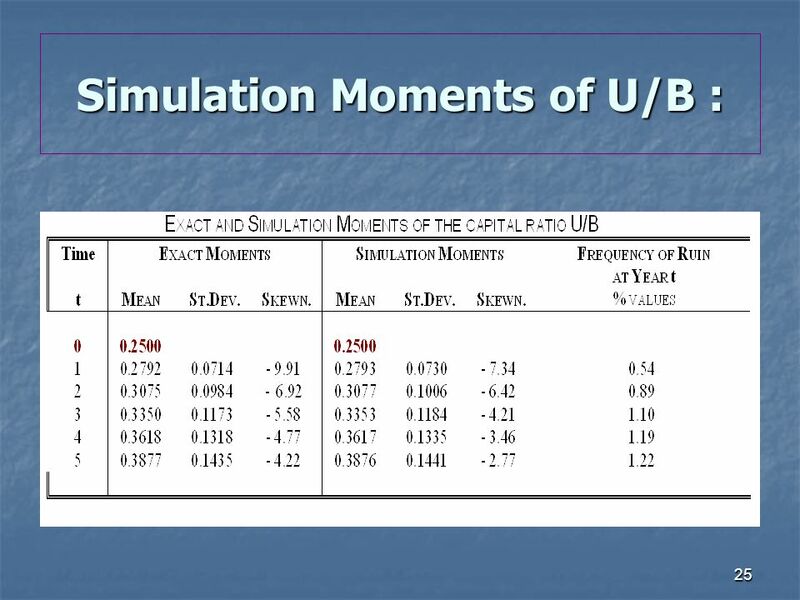 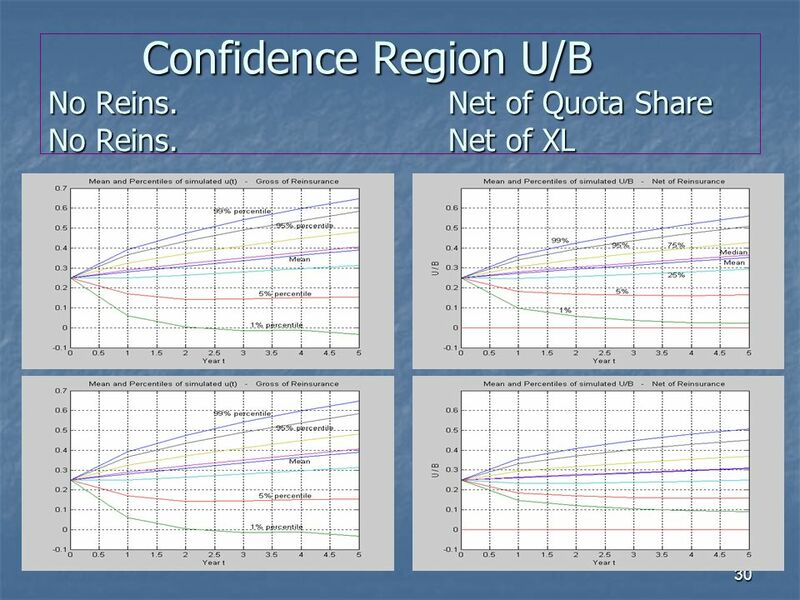 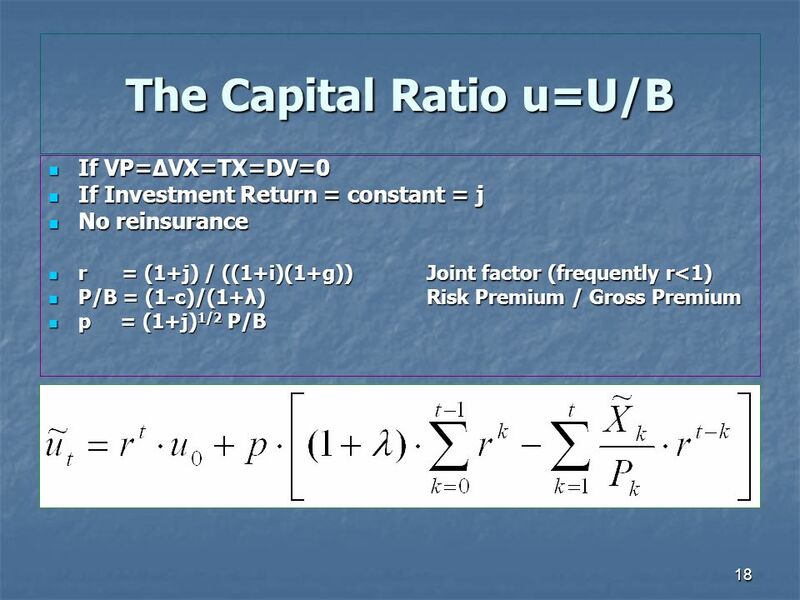 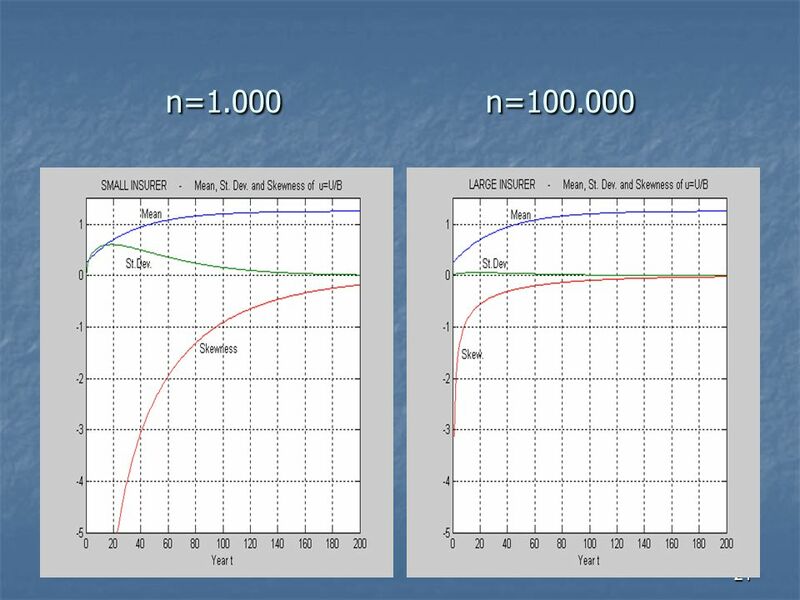 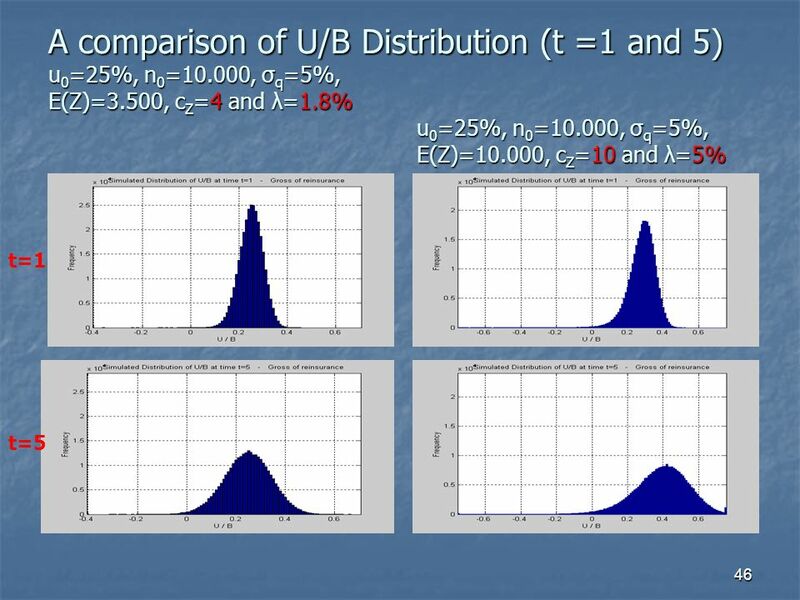 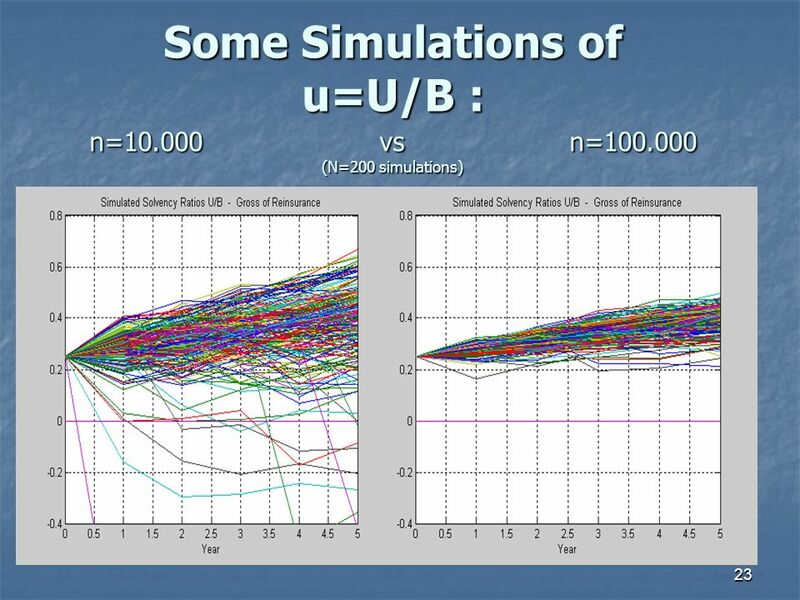 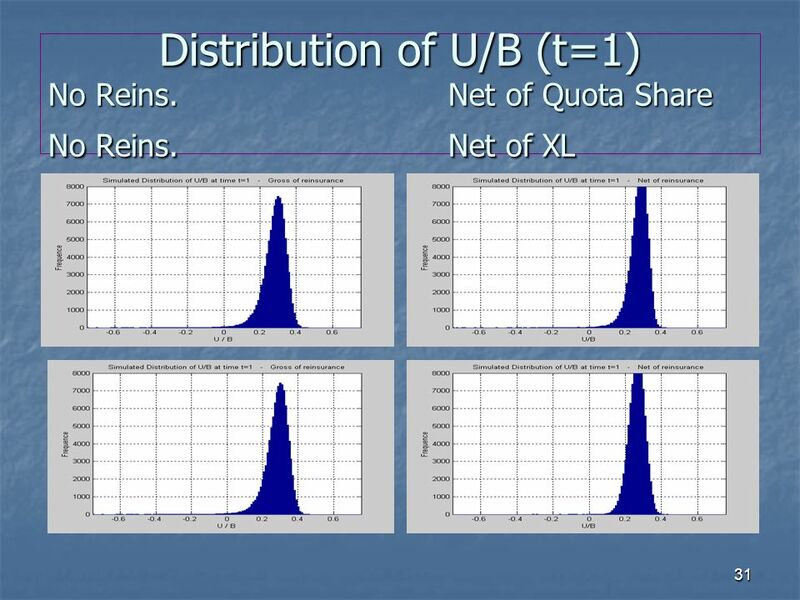 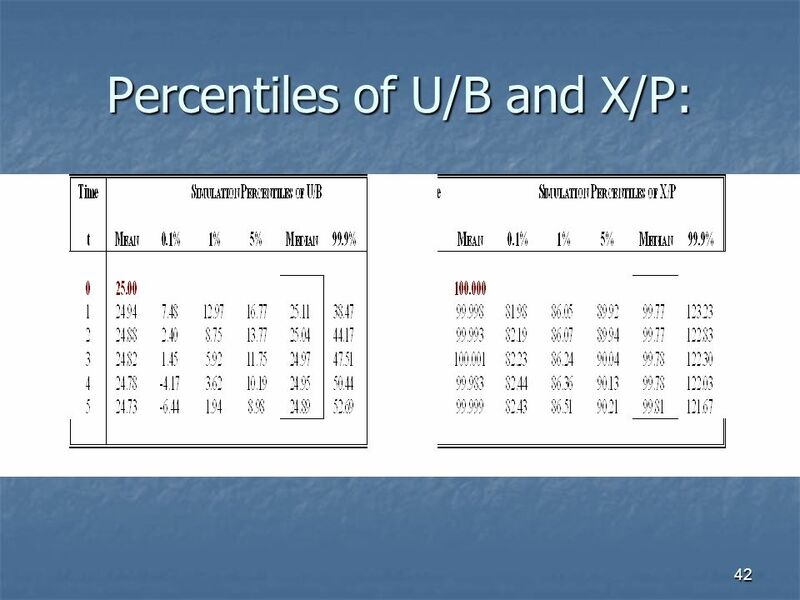 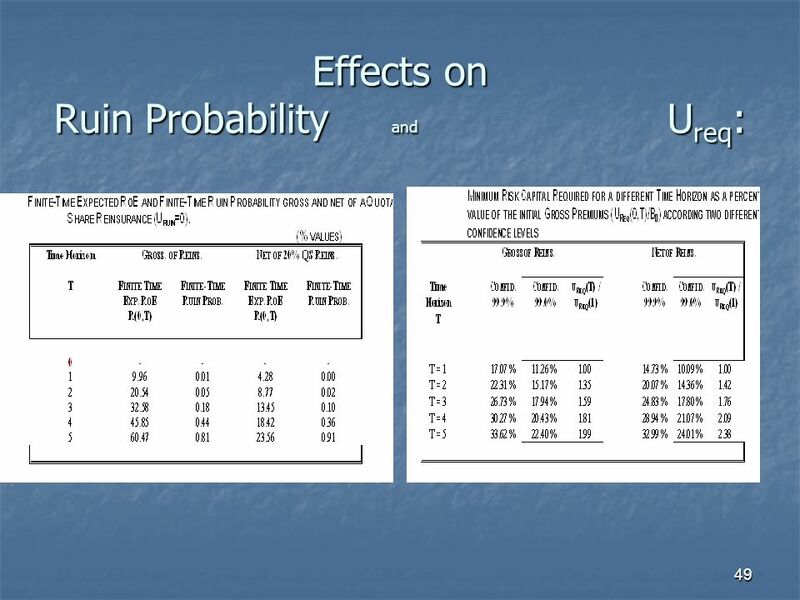 It is useful to note that for the Medium Insurer the expected value of the Profit Ratio Y/B is increasing approximately from 4,50% of year 1 to 5% of year 5; The amplitude of the Confidence Region is rising time to time according the non-convexity behaviour of the standard deviation of the ratio u=U/B; The amplitude of the Confidence Region is rising time to time according the non-convexity behaviour of the standard deviation of the ratio u=U/B; Because of positive skewness of the Total Claim Amount X t, both Risk Reserve U t and Capital ratio u=U/B present a negative skewness, reducing year by year for: Because of positive skewness of the Total Claim Amount X t, both Risk Reserve U t and Capital ratio u=U/B present a negative skewness, reducing year by year for: - the increasing volume of risks (g=+5%) - the assumption of independent annual technical results (no autocorrelations – no long-term cycles). 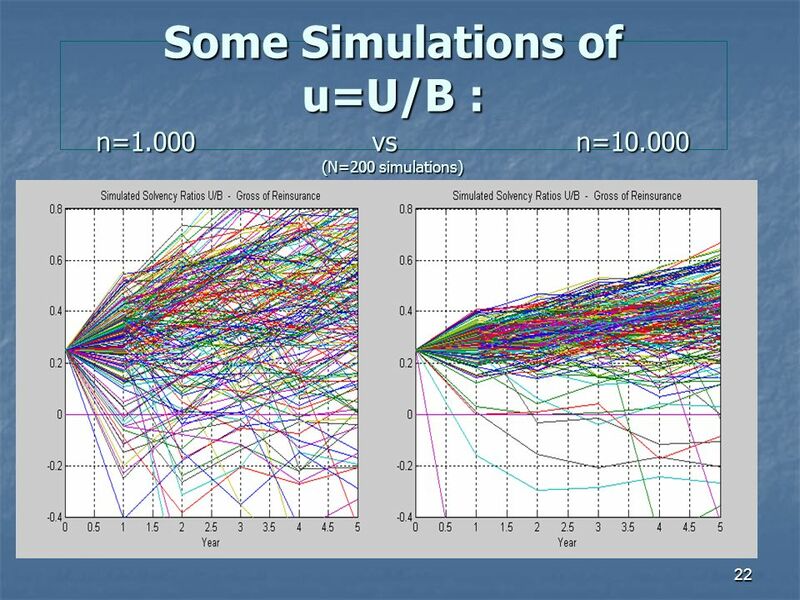 (no autocorrelations – no long-term cycles). 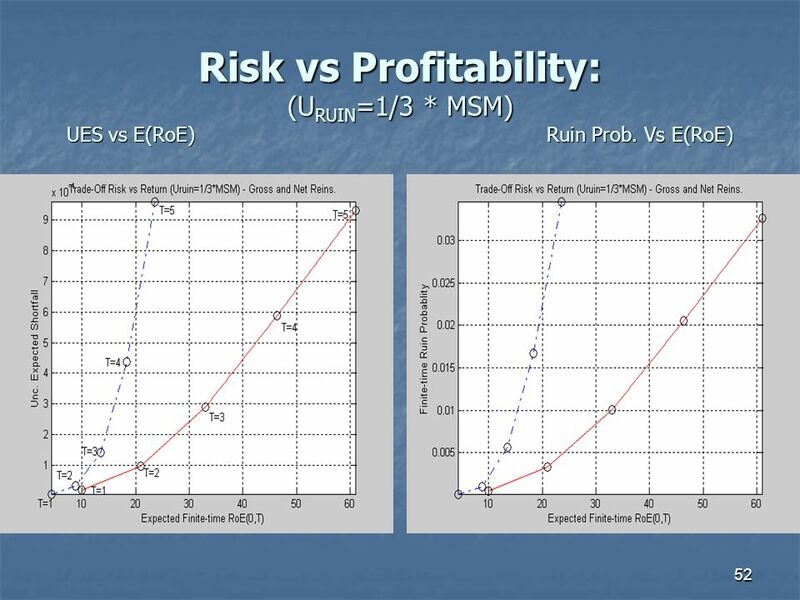 50 50 Simulating a trade-off function Ruin Probability (or UES) vs Expected RoE can be figured out for all the reinsurance strategies available in the market, with a minimum and a maximum constraint Ruin Probability (or UES) vs Expected RoE can be figured out for all the reinsurance strategies available in the market, with a minimum and a maximum constraint Minimum constraint: for the Capital Return (e.g. 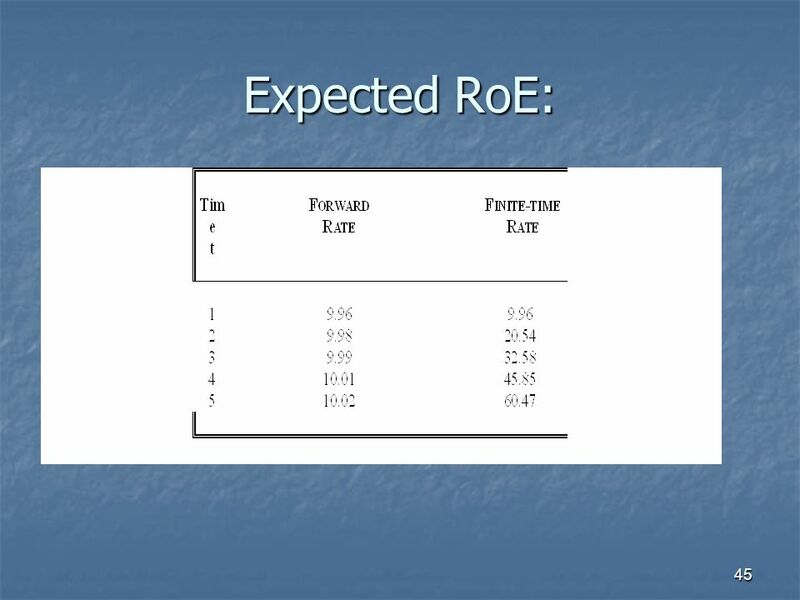 E(RoE)>5%) Minimum constraint: for the Capital Return (e.g. 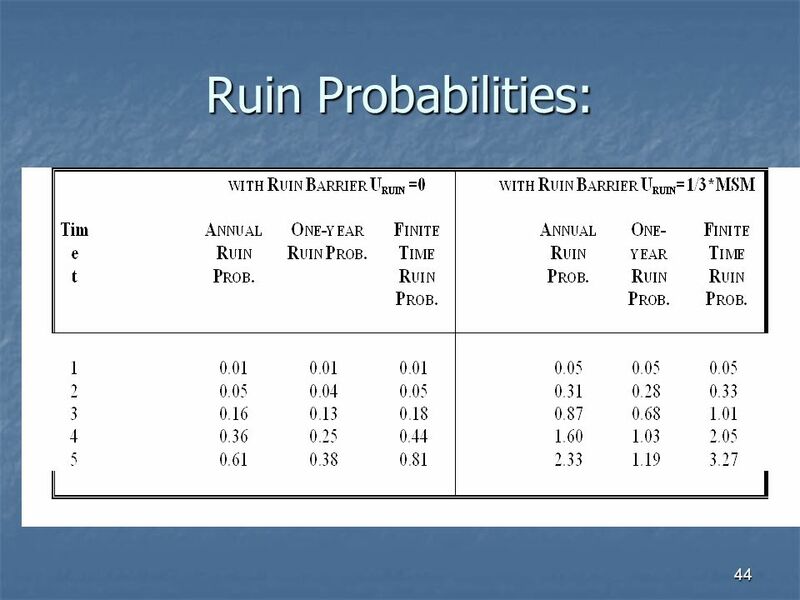 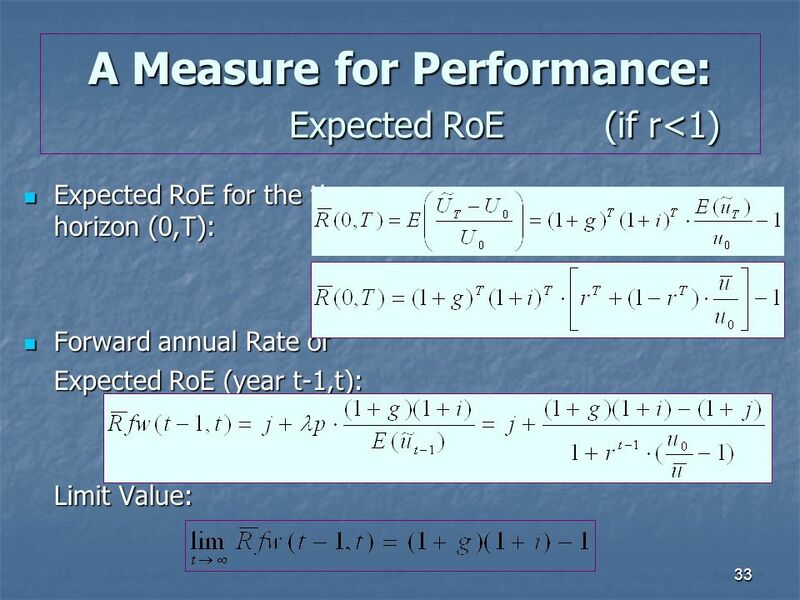 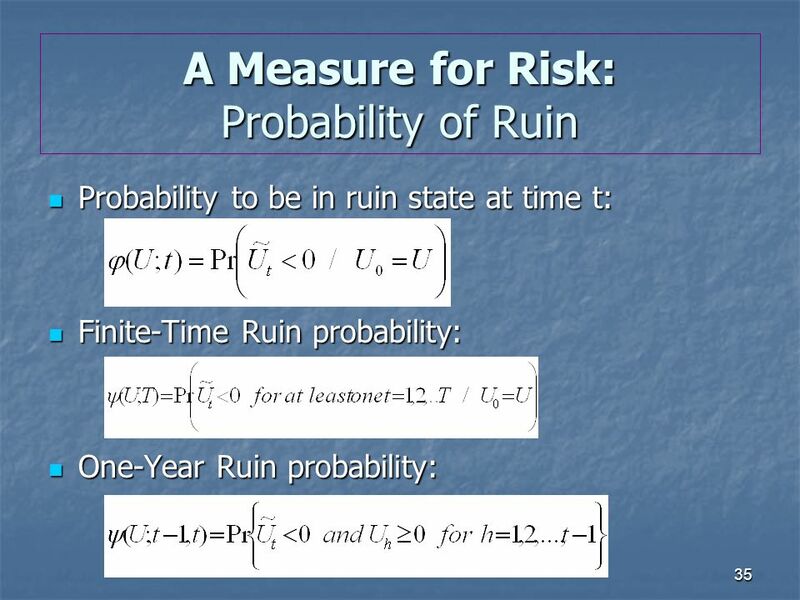 E(RoE)>5%) Maximum constraint: for the Ruin Probability (e.g. 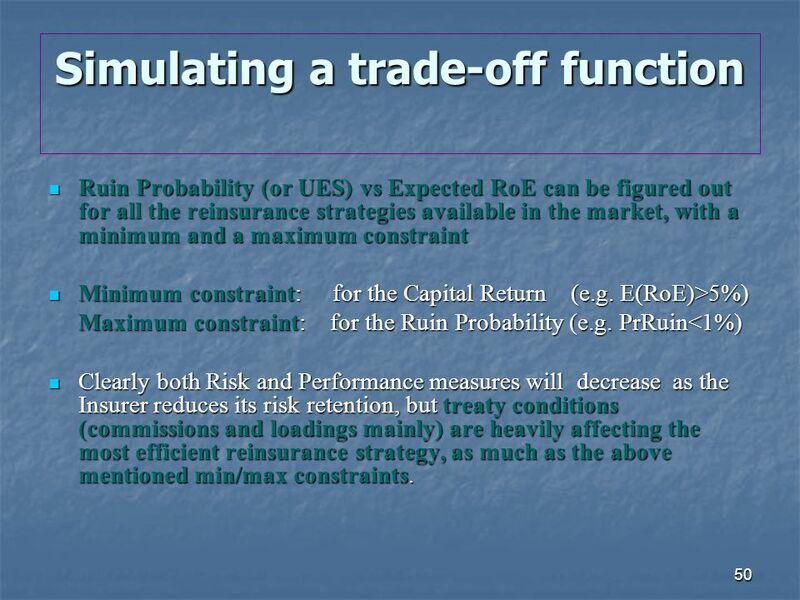 PrRuin<1%) Clearly both Risk and Performance measures will decrease as the Insurer reduces its risk retention, but treaty conditions (commissions and loadings mainly) are heavily affecting the most efficient reinsurance strategy, as much as the above mentioned min/max constraints. 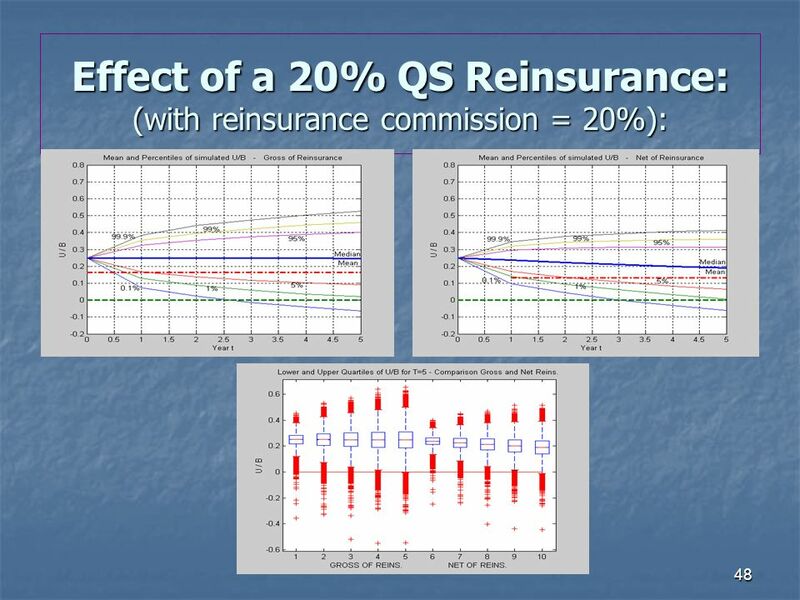 Clearly both Risk and Performance measures will decrease as the Insurer reduces its risk retention, but treaty conditions (commissions and loadings mainly) are heavily affecting the most efficient reinsurance strategy, as much as the above mentioned min/max constraints. 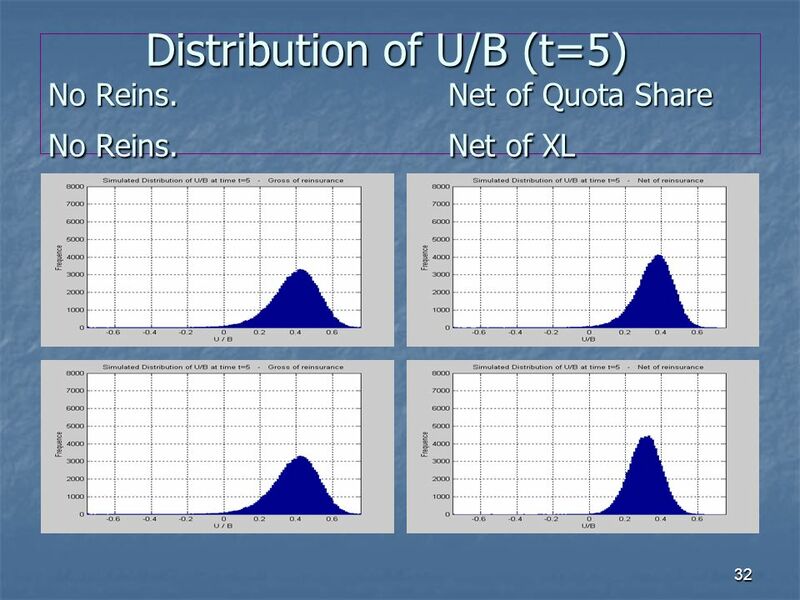 56 56 It is possible to define an efficient frontier for the trade-off Insolvency Risk / Shareholders Return according different reinsurance treaties and different retentions according the available pricing in the market; In many cases the EU Minimum Solvency Margin is not reliable and an unsuitable risk profile is reached also for a short time horizon (T2) in the results of simulations. 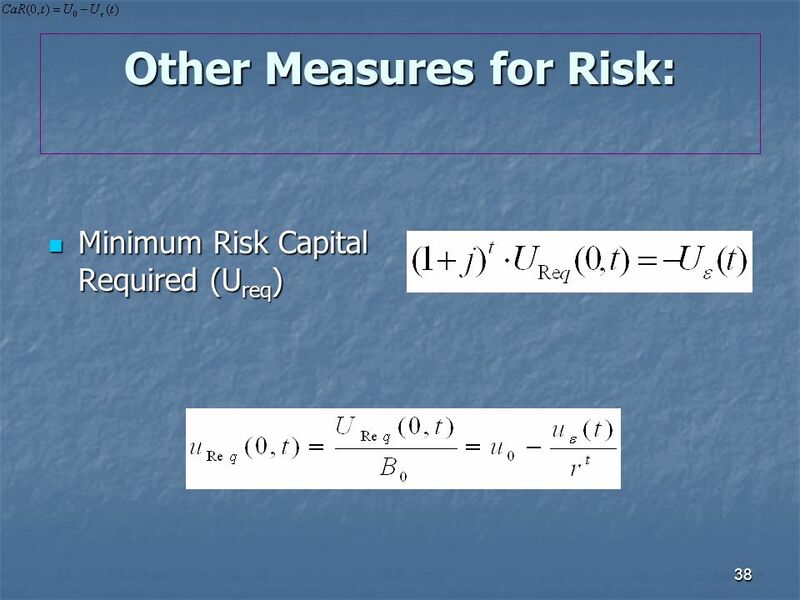 It is to emphasize that in our simulations neither investment risk nor claims reserve run-off risk have been considered, and all the amounts are gross of taxation. 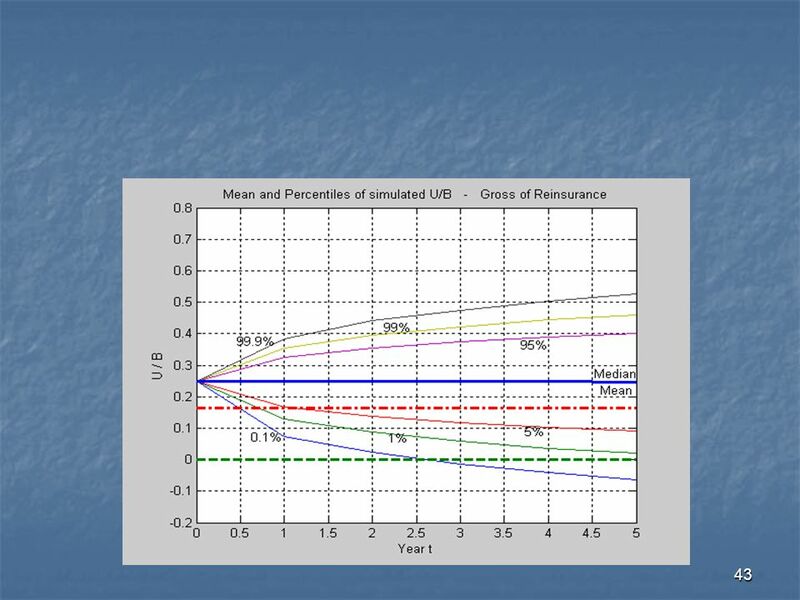 57 57 Insurance Solvency II: these simulation models may be used for defining New Rules for Capital Adequacy (also for consolidated requirements); A new approach of Supervising Authorities: A new approach of Supervising Authorities: assessing the solvency profile of the Insurer according to more or less favourable scenarios (different level of control) and to indicate the appropriate measures in case of an excessive risk of insolvency in the short-term. 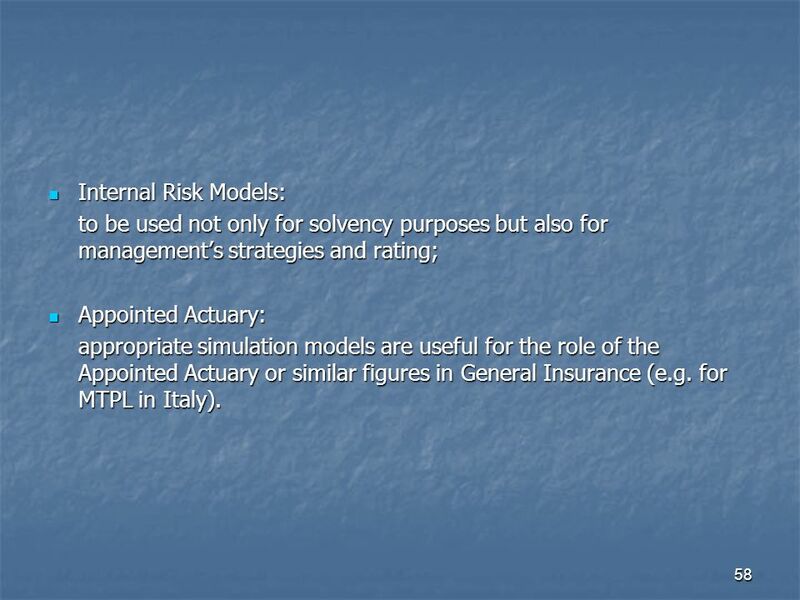 58 58 Internal Risk Models: Internal Risk Models: to be used not only for solvency purposes but also for managements strategies and rating; Appointed Actuary: Appointed Actuary: appropriate simulation models are useful for the role of the Appointed Actuary or similar figures in General Insurance (e.g. 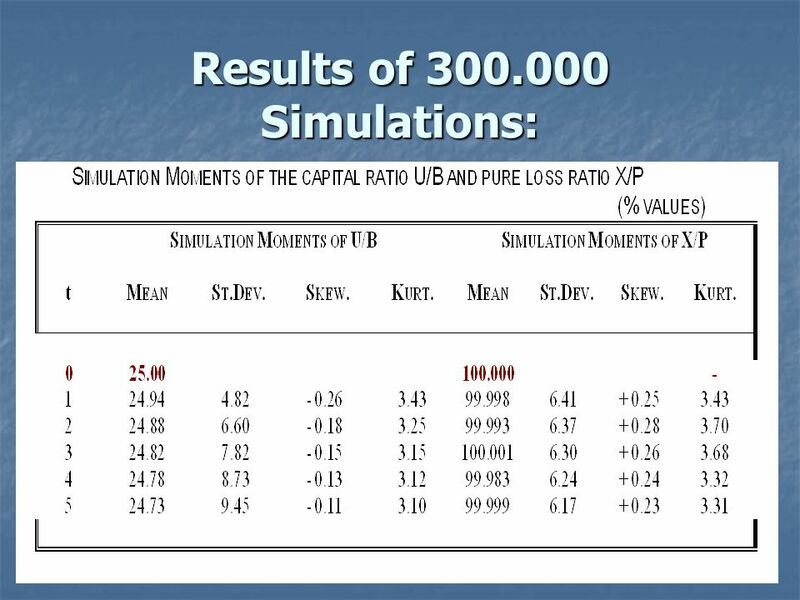 for MTPL in Italy). 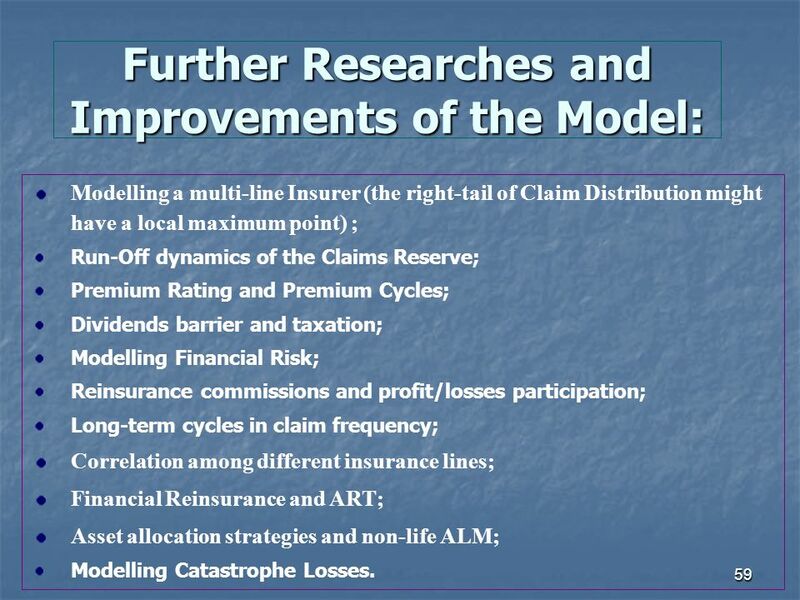 59 59 Further Researches and Improvements of the Model: Modelling a multi-line Insurer (the right-tail of Claim Distribution might have a local maximum point) ; Run-Off dynamics of the Claims Reserve; Premium Rating and Premium Cycles; Dividends barrier and taxation; Modelling Financial Risk; Reinsurance commissions and profit/losses participation; Long-term cycles in claim frequency; Correlation among different insurance lines; Financial Reinsurance and ART; Asset allocation strategies and non-life ALM; Modelling Catastrophe Losses. 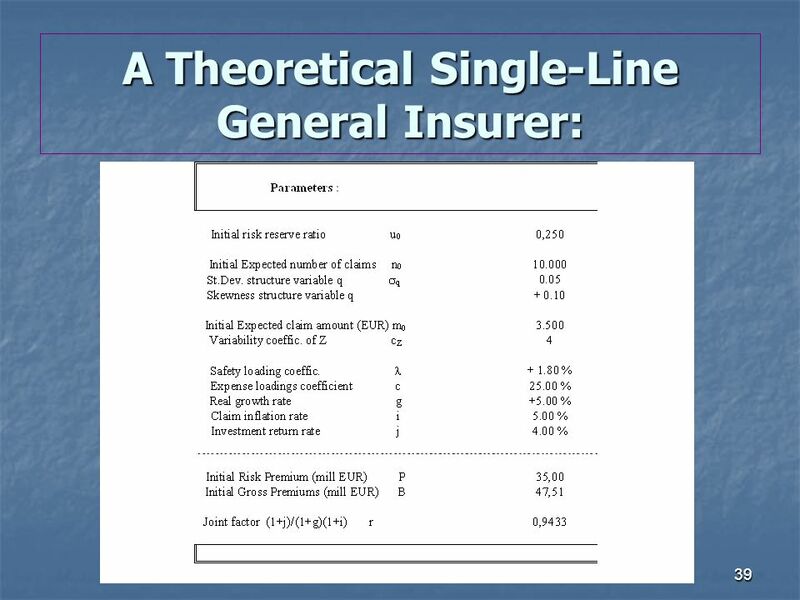 Download ppt "1 SOLVIBILITA E RIASSICURAZIONE TRADIZIONALE NELLE ASSICURAZIONI DANNI N. Savelli Università Cattolica di Milano Seminario Università Cattolica di Milano." 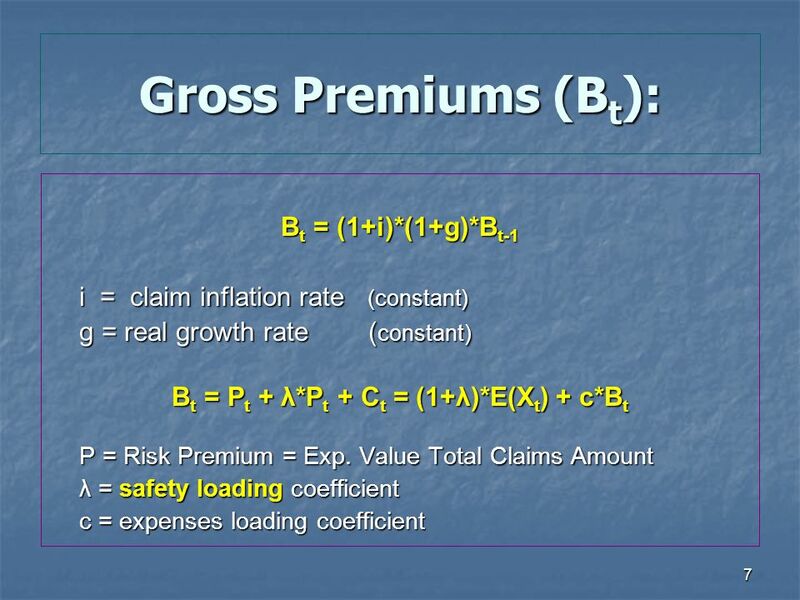 Jennifer Marshall Senior Financial Analyst Property/Casualty Division February 12, 2009 Treatment of Investments in the A.M. Best Rating Process NYIA Educational. 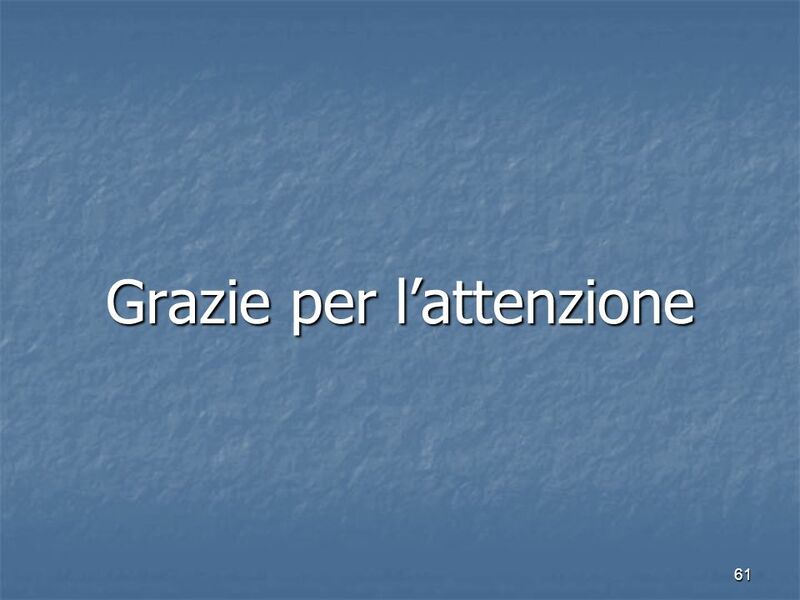 Contents: The Consortium Background Goal Objectives Methodology, dissemination strategies and timetable UNIVERSITA CATTOLICA DEL SACRO CUORE MILANO. 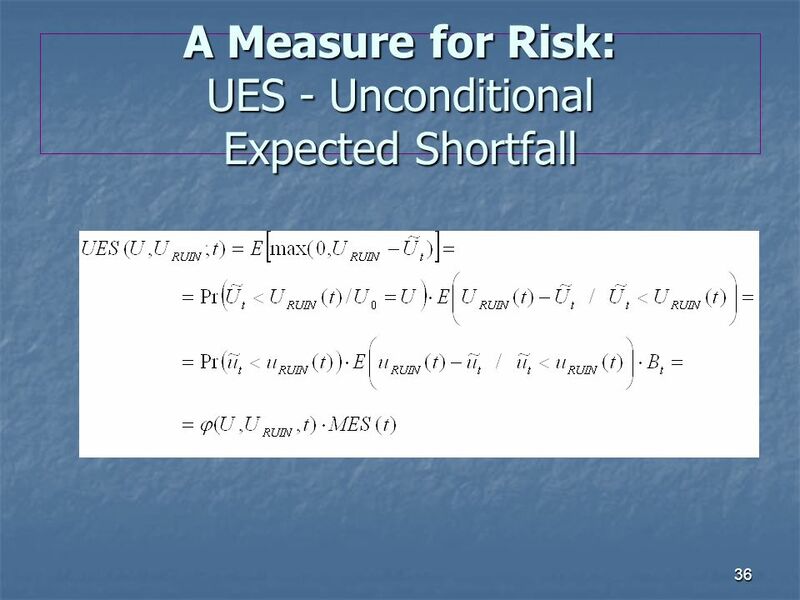 1 Practical and Business Implications of Basel 2 for UK Mortgage Lenders. 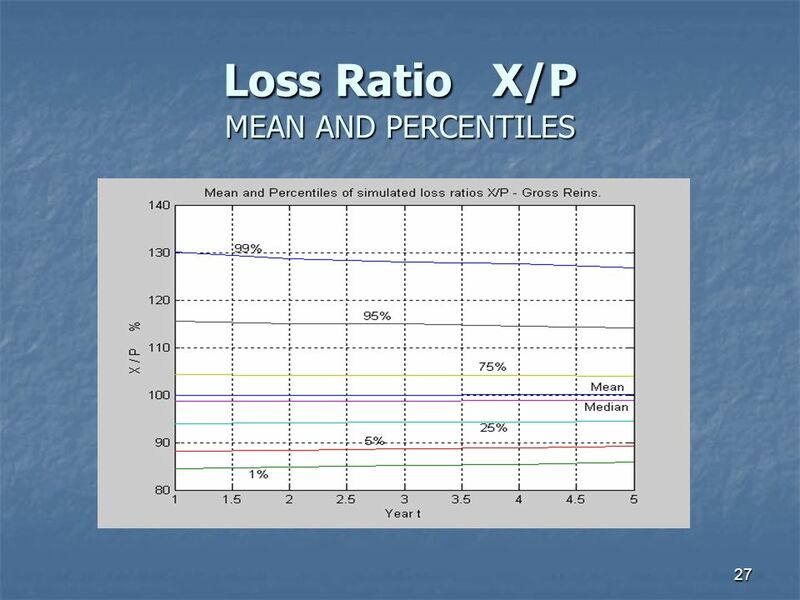 Bruce T Porteous 29 April 2004. 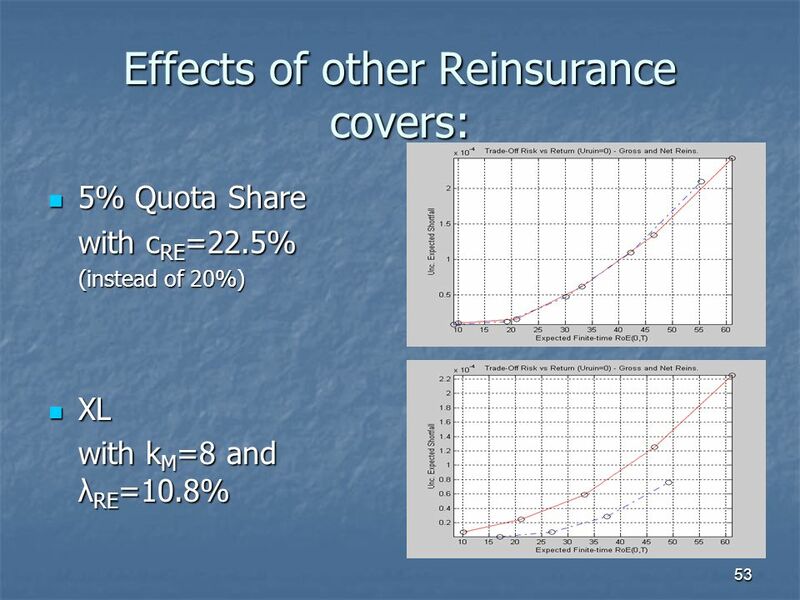 1 On Optimal Reinsurance Arrangement Yisheng Bu Liberty Mutual Group. 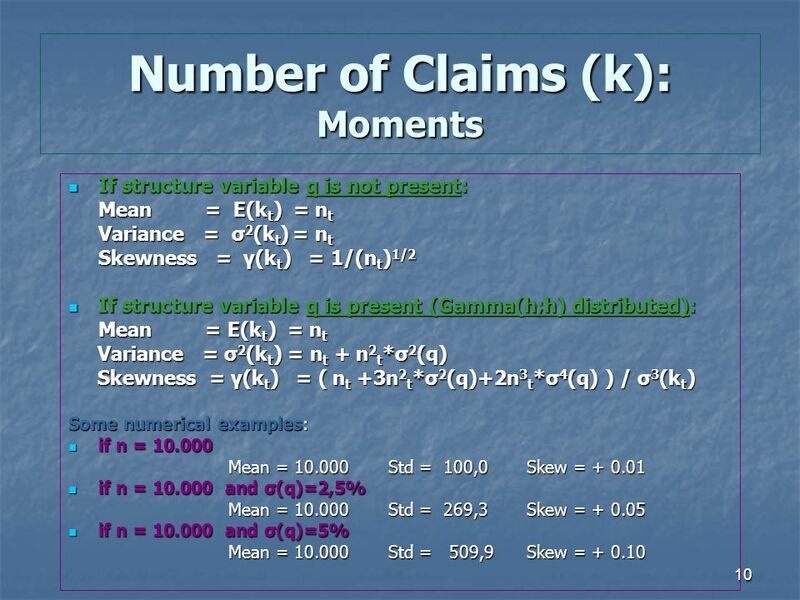 ICP 20 Public Disclosure Yoshihiro Kawai IAIS-ASSAL Conference 22 April 2014. 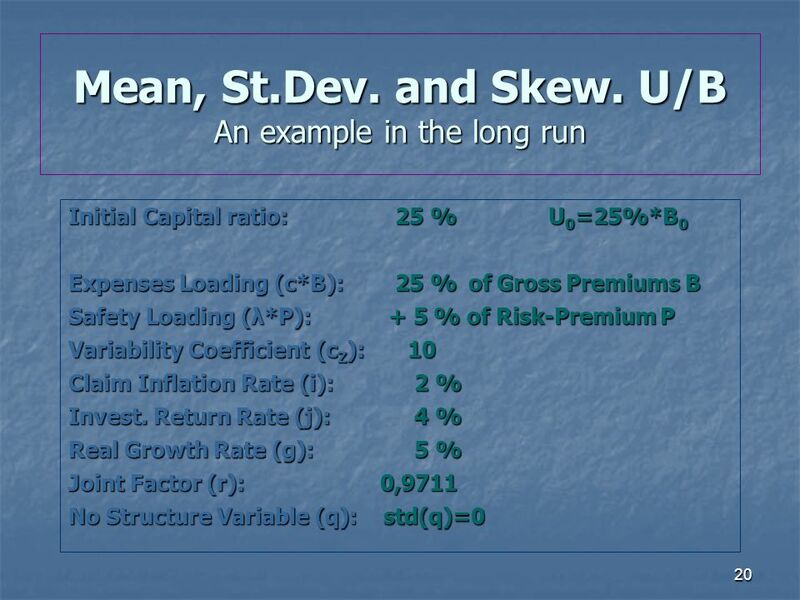 1 PROVISIONS FOR PROFIT AND CONTINGENCIES (MIS-35) Seminar on Ratemaking Nashville, TNRuss Bingham March 11-12, 1999Hartford Financial Services. 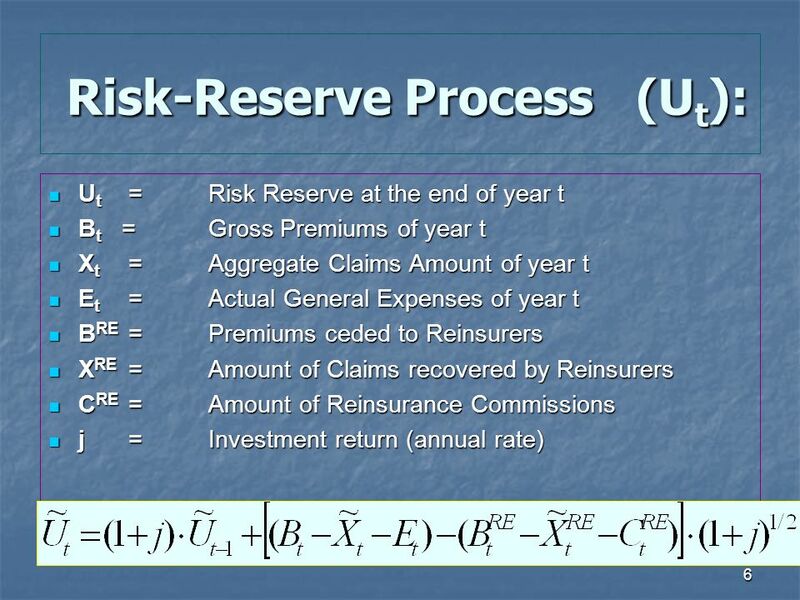 XXIII Annual ASSAL General Meeting US Risk-Based Supervision Director Christina Urias April 23, 2012. 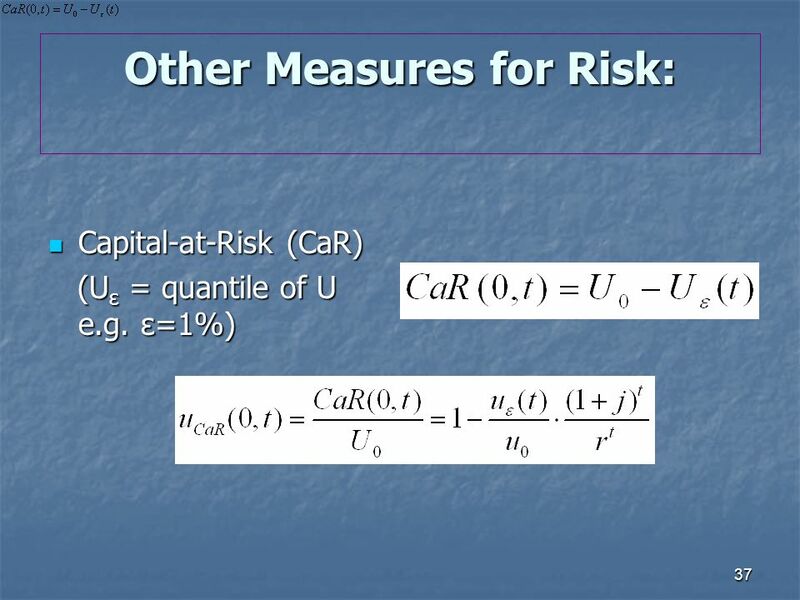 Own Risk & Solvency Assessment (ORSA): The heart of Risk & Capital Management John Spencer Director, Ultimate Risk Solutions. 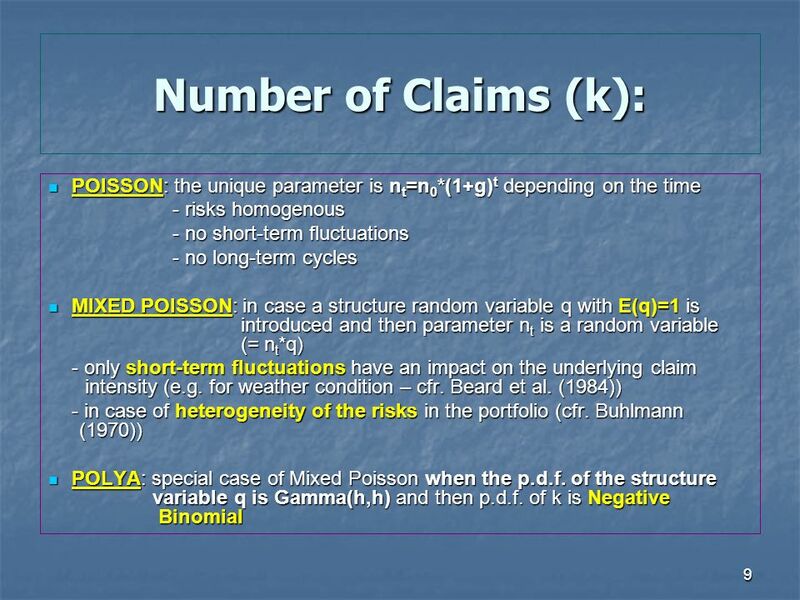 FSVC/Central Bank of Libya Seminar - January Day 3 Establishing a Modern Risk Management Department Basel II and Bank Risk Management Garrett R.
Monitoring Compliance with the Basel II Accord Charles H. Le Grand Reliability of Global Financial Infrastructures, Information, and Reporting Accountability. 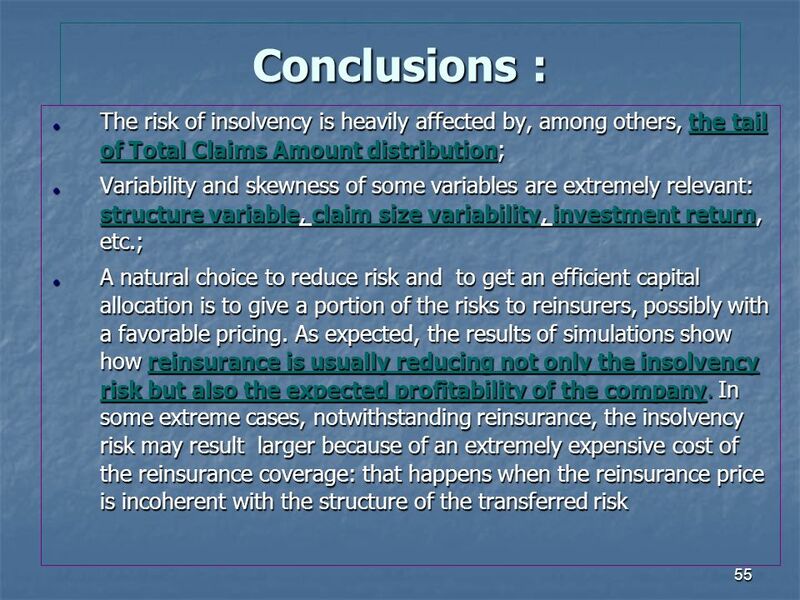 The Development of Enterprise Risk Management and Supervision for Insurance Companies in Taiwan Dr. Huang, Tien-Mu Director General, Insurance Bureau Financial. 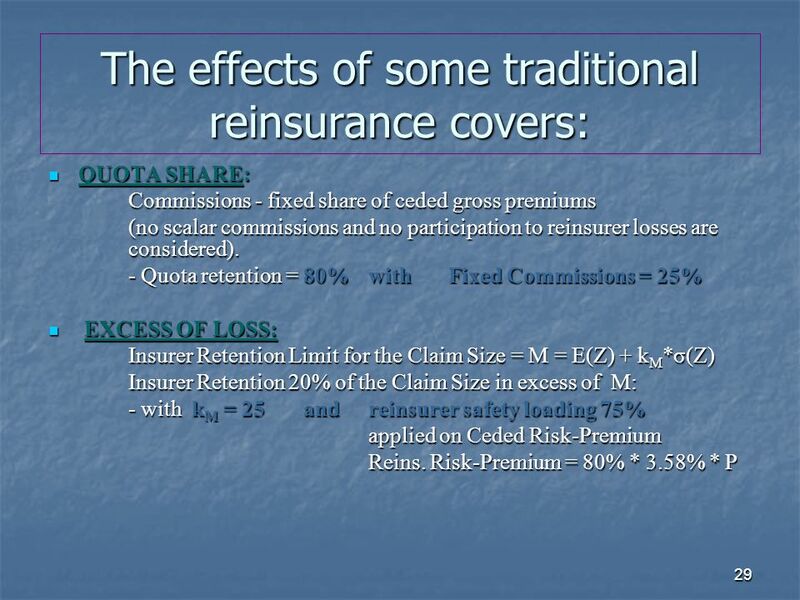 Reinsurance Session 4. 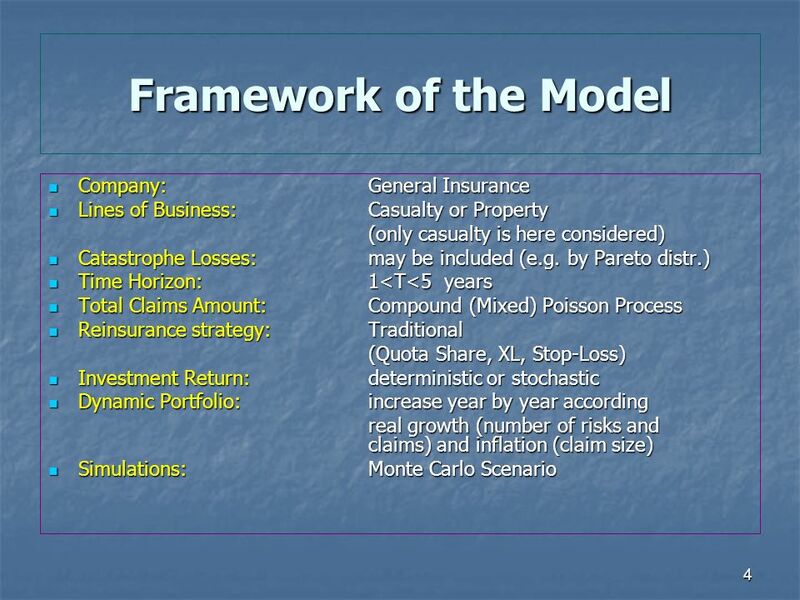 Reinsurance ICP 19 Capital Adequacy & Reinsurance Reinsurer Credit Risk Capital Quality Onsite Inspection Approach to Catastrophe. 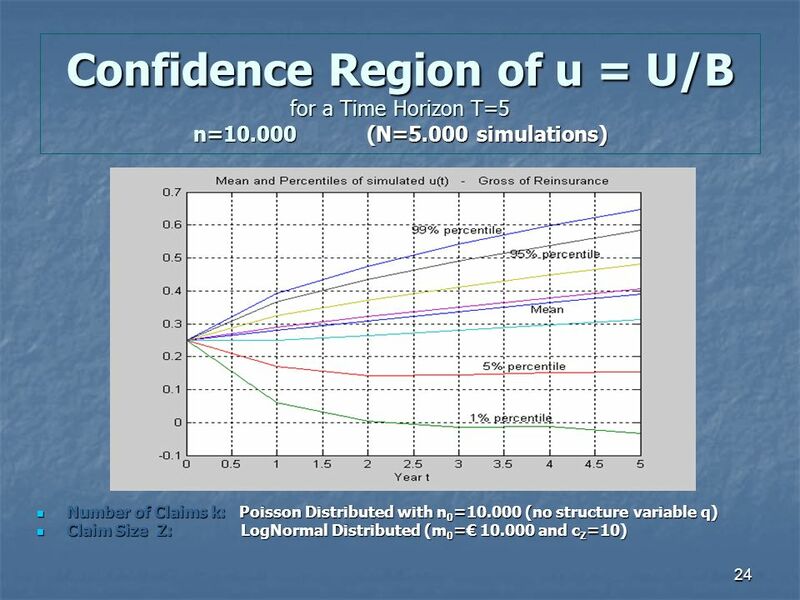 The ROLE of the ACTUARY in INSURANCE PRUDENTIAL SUPERVISION Yangon, Myanmar 14 July 2014 Chi Cheng Hock, FFA. 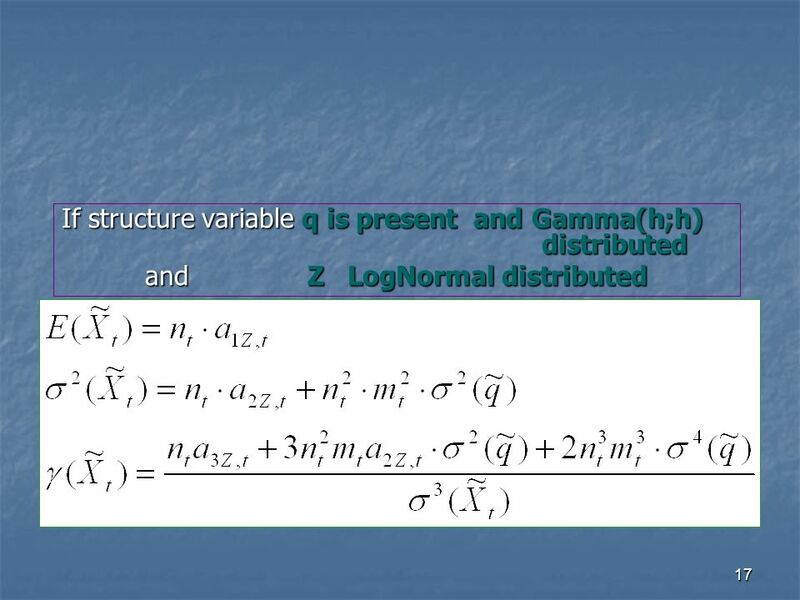 ZAVAROVALNICA TRIGLAV, d.d. 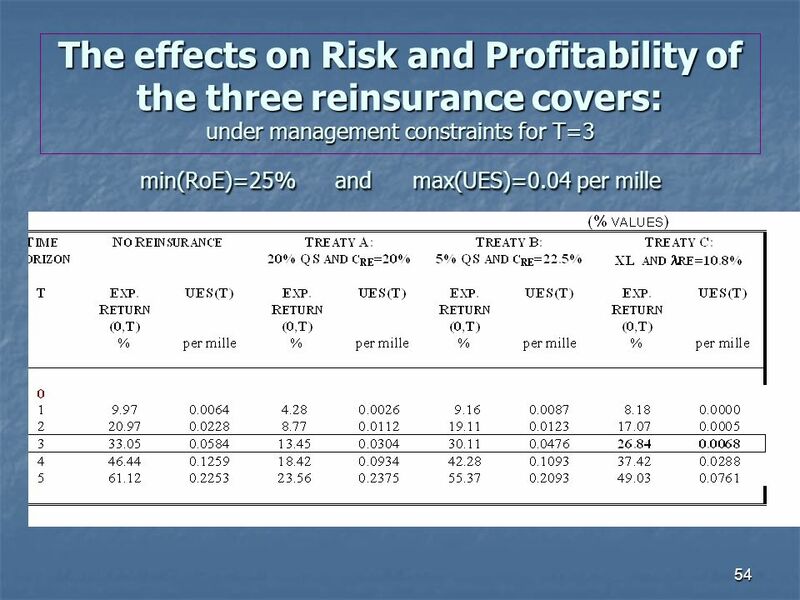 page 1 R ISK M ANAGEMENT IN I NSURANCE BUDVA, 18 OCTOBER 2012 Author: Dr. Mojca Piškurić Chief Risk Officer. 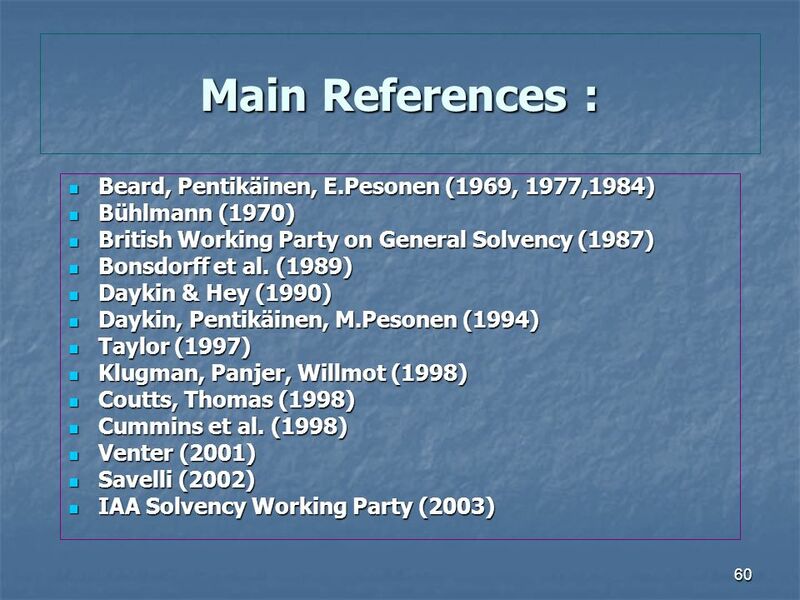 Case Study - Consolidated Oversight - Regional Training Seminar IAIS-ASSAL-FIDES 26 November 2009, Lima Peru Takao Miyamoto, IAIS Secretariat. 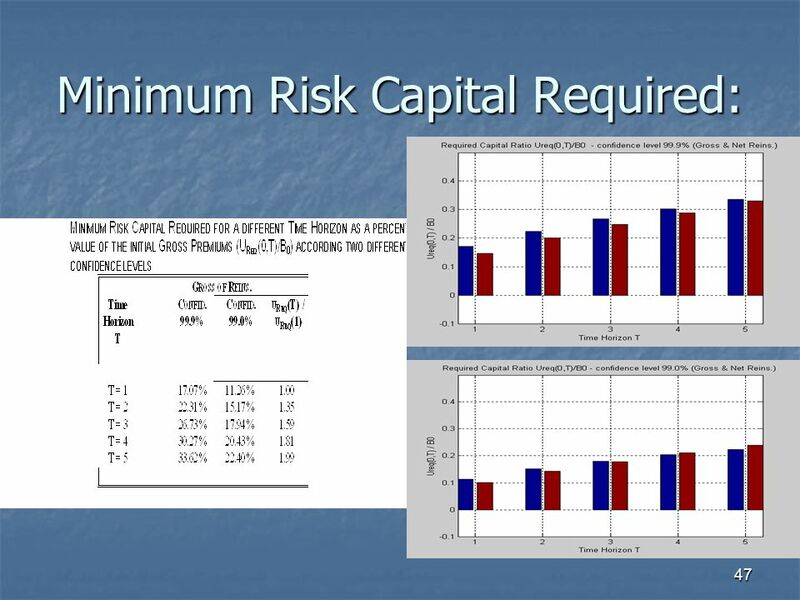 ERM in the Rating Evaluation CAMAR Fall Meeting November 29, 2007 Thomas M. Mount, ACAS, MAAA Andrew Colannino, Vice President A.M.Best Company. 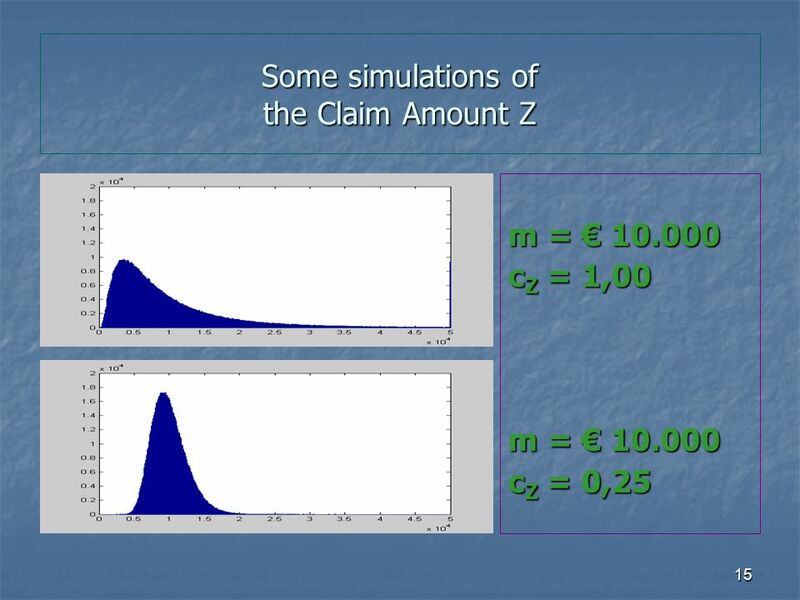 MANAGEMENT SIMULATION MODELS AND SOLVENCY IN GENERAL INSURANCE ___________________ Nino Savelli Università Cattolica di Milano VI Congresso Nazionale di.